Sect of primitive Christianity; it appears to have embraced all those Christians who had been born Jews and who neither would nor could give up their Jewish mode of life. They were probably the descendants of the Judæo-Christians who had fled to Pella before Titus destroyed Jerusalem; afterward most of them, like the Essenes in former times, with whom they had some characteristics in common, lived in the waste lands around the Dead Sea, and hence remained out of touch with the rest of Christendom. For a long time they were regarded as irreproachable Christians, Epiphanius ("Hæres." xxix. ), who did not know much about them, being the first to class them among heretics. Why they are so classed is not clear, for they are reproached on the whole with nothing more than with Judaizing. As there were many Judaizing Christians at that time, the Nazarenes can not be clearly distinguished from the other sects. The well-known Bible translator Symmachus, for example, is described variously as a Judaizing Christian and as an Ebionite; while his followers, the Symmachians, are called also "Nazarenes" (Ambrosian, "Proem in Ep. ad Gal.," quoted in Hilgenfeld, "Ketzergesch." p. 441). It is especially difficult to distinguish the Nazarenes from the Ebionites. Jerome obtained the Gospel according to the Hebrews (which, at one time regarded as canonical, was later classed among the Apocrypha) directly from the Nazarenes, yet he ascribed it not only to them but also to the Ebionites ("Comm. in Matt." xii. 13). This gospel was written in Aramaic, not in Hebrew, but it was read exclusively by those born as Jews. Jerome quotes also fragments from the Nazarenic exposition of the Prophets (e.g., of Isa. viii. 23 [in the LXX. ix. 1]). These are the only literary remains of the Nazarenes; the remnants of the Gospel according to the Hebrews have recently been collated by Preuschen in "Antilegomena" (pp. 3-8, Giessen, 1901). Jerome gives some definite information concerning the views of the Nazarenes ("Ep. lxxxix. ad Augustinum"). "What shall I say of the Ebionites who pretend to be Christians? 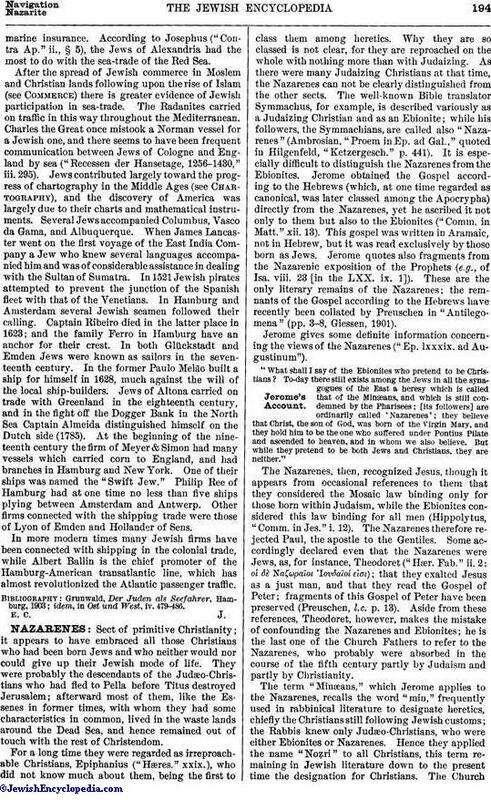 To-day there still exists among the Jews in all the synagogues of the East a heresy which is called that of the Minæans, and which is still condemned by the Pharisees; [its followers] are ordinarily called 'Nazarenes'; they believe that Christ, the son of God, was born of the Virgin Mary, and they hold him to be the one who suffered under Pontius Pilate and ascended to heaven, and in whom we also believe. But while they pretend to be both Jews and Christians, they are neither." The Nazarenes, then, recognized Jesus, though it appears from occasional references to them that they considered the Mosaic law binding only for those born within Judaism, while the Ebionites considered this law binding for all men (Hippolytus, "Comm. in Jes." i. 12). The Nazarenes therefore rejected Paul, the apostle to the Gentiles. Some accordingly declared even that the Nazarenes were Jews, as, for instance, Theodoret ("Hær. Fab." ii. 2: οἱ δὲ Ναζωραῖοι Ἰουδαῖοί εἰσι); that they exalted Jesus as a just man, and that they read the Gospel of Peter; fragments of this Gospel of Peter have been preserved (Preuschen, l.c. p. 13). Aside from these references, Theodoret, however, makes the mistake of confounding the Nazarenes and Ebionites; he is the last one of the Church Fathers to refer to the Nazarenes, who probably were absorbed in the course of the fifth century partly by Judaism and partly by Christianity. 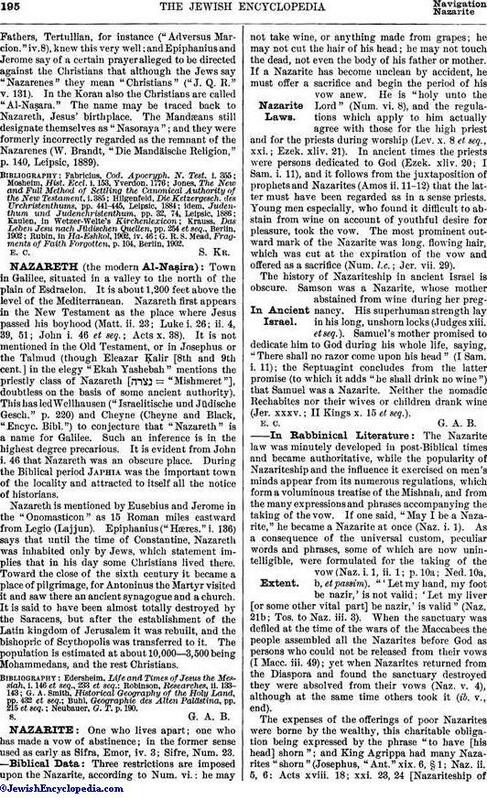 The term "Minæans," which Jerome applies to the Nazarenes, recalls the word "min," frequently used in rabbinical literature to designate heretics, chiefly the Christians still following Jewish customs; the Rabbis knew only Judæo-Christians, who were either Ebionites or Nazarenes. Hence they applied the name "Noẓri" to all Christians, this term remaining in Jewish literature down to the present time the designation for Christians. The ChurchFathers, Tertullian, for instance ("Adversus Marcion." iv. 8), knew this very well; and Epiphanius and Jerome say of a certain prayer alleged to be directed against the Christians that although the Jews say "Nazarenes" they mean "Christians" ("J. Q. R." v. 131). In the Koran also the Christians are called "Al-Naṣara." The name may be traced back to Nazareth, Jesus' birthplace. The Mandæans still designate themselves as "Nasoraya"; and they were formerly incorrectly regarded as the remnant of the Nazarenes (W. Brandt, "Die Mandäische Religion," p. 140, Leipsic, 1889). G. R. S. Mead, Fragments of Faith Forgotten, p. 104, Berlin, 1902.